Have fun the our way great grandparents did! 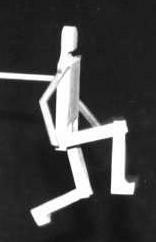 This is Charlie Alm's original design Limberjack Dancing Doll. He's made them this way since 1953! With many thousands sold all over the world, this has become the defacto design for Limberjacks. While fun all by itself, the limberjack is a great musical instrument and is often used with various types of folk music, as a precussion instrument, and is also found in many doll collections. Often used in old-time, Celtic, Irish and various other folk forms of music. They are also popular with storytellers, puppeteers, and (I almost forgot) KIDS!. Some people like to leave their natural wood finish and others prefer to paint, decorate, or even clothe them in tiny fabric clothes! Often they have faces drawn, painted or carved on their heads. Limberjacks are known by many other names, including: Limber Jill, dancing man, dancing Dan, jig doll, and so on. The Limberjack is ten and a half inches tall and is jointed at the shoulders, hips and knees. The paddle board is 24 inches long and made of Baltic birch. The stick is of domestic birch and is 18 inches in length. The doll may be made of poplar (the Indiana state tree), walnut, cherry, maple or any other wood we fancy. At this time we do not take special requests for the material of the Limberjack. When your Limberjack Dancing Doll arrives, there will be 3 parts in the box: the paddle board, the stick, and the Limberjack. The stick is not attached yet (for better shipping rate). Place the Limberjack face down on a sturdy surface like a table or the floor. Position one end of the stick over the hole in the Limberjack's back, and tap the top of the stick gently with a hammer to drive it into the hole. It should go in about one quarter of an inch. Your little guy is now ready to dance! To make him dance, you sit on one end of the paddle board, hold the little guy with one hand out near the farthest end of the board (click on the B&W pic above to see how), and bounce the board with your other hand -- he dances up a storm! To get him to dance the very best, you will want to sit on a wooden chair or stool (not upholstered). This way the bouncing of the paddle board is much crisper, making for a lot better dancing by the Limberjack. The Limberjack has been around for hundreds of years, originally coming to our country from Europe. Often they are hand made, though they were also mass-produced in the US as early as 1900. This little fellow can dance to any kind of music, even whistling or singing. Take care of him and he will be around to give you and generations to come many a bright little dance! Our little dancing man is made of any of a variety of hardwoods, including: maple, cherry, ash, poplar, walnut, birch, chestnut, etc. We use recycled / "2nd life" materials whenever we can for the body. Our current batch is made from birch and poplar out of an old piano, so the limberjacks have already have already had music in their bones for over 150 years! The stick is made of either birch or maple, and the paddle board is made of Baltic birch. Click here to see what people say about our limberjack dancing dolls! Click here to see some really cool things people have done with our limberjacks! When a lady called and asked if we could make a Limberjack chicken, we sat down with a pencil and did some sketching and this is what came out. Our new Limberjack Dancing Chicken is a comical little character and really dances up a storm. 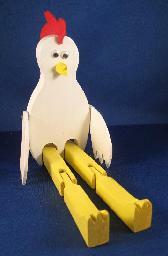 The Limberjack Dancing Chicken is ten and a half inches tall and has jointed wings, hips and knees. The paddle board is 24 inches long and made of Baltic birch. The stick is of domestic birch and is 18 inches in length. Your Limberjack Dancing Chicken will arrive with: the paddle board, the stick, and the Limberjack Chicken. The stick is not attached yet (better shipping rate). Put the Limberjack Chicken face down on the table. Put the stick over the hole in the Limberjack Chicken's back and tap it gently in about 1/4 inch. (You may want to put some glue in the hole first.) Your little chicken is now ready to dance! Some of this Dance-Crazed Chicken Limberjack's favorite tunes are the Chicken Reel, the Chicken Dance (you know the one), and Turkey in the Straw. Nowadayz there's a panic in the hen house when the fiddle starts to play!!! Click here to see Fabrizio Bezzini dancing one of our Limberjack Chickens while playing old time clawhammer banjo in Istanbul, Turkey! She called me from Texas and said her eight year old son loved moose (or mooses?) and was there any way we could make a dancing moose for her. I don't think they eben have moose in Texas, but little Timmy now has a genuine toe-tapping North-woods moose critter! The Limberjack Dancing Moose is ten and a half inches tall with beautiful six point antlers. He has jointed front legs, hips and knees. The paddle board is 24 inches long and made of Baltic birch. The stick is an 18 inch dowel rod. When your Dancing Moose arrives, the stick is not attached yet (better shipping rate). Put the Limberjack Moose face down on the table with his head sticking over the edge. Put the stick over the hole in the Limberjack Moose's back and tap it gently in about 1/4 inch. (You may want to put some glue in the hole first.) Your little moose is now ready to dance! Baffle and amaze your family and friends with the mysterious "Hooey Stick"! Get the Hooey Stick's propeller spinning as you rup it with the short stick, then stamp your right foot and holler, "HOOEY!" Your Hooey Stick's propeller changes directions as if by magic at your command. How can it be?? Is it magic? Or is it a bunch of "hooey"? The Hooey Stick's other name, Gee Haw Whimmey Diddle, comes from the "gee" and "haw" which were verbal commands you would give a horse to tell it to go left or right. This old time toy is a real hoot and will have those you show it to scratching their heads for hours. The trick of doing it is easy once you know the secret. Instruction sheet "How to Operate the Hooey Stick" is included with every one. 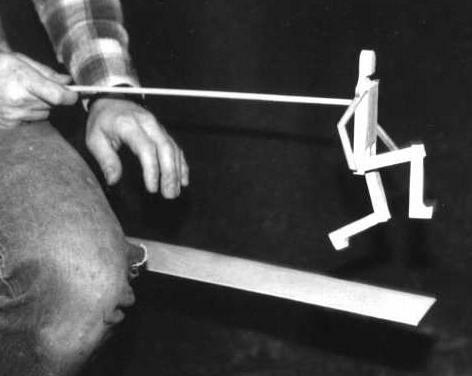 The Whirlygig is a flying toy that you launch with a simple two-handed motion. This great folk toy demonstrates the principle of the windmill's rotor or the airplane's propeller. Put the stick between you hands. Pull one hand toward you and push the other away -- the whirlygig's rotor lifts is high into the air. You can make it fly to amazing heights. It is probably not true, but Charlie sometimes says the Wright Brothers got their idea for their airplane from playing around with a Whirlygig when they were kids back in Ohio. When you are flying the Whirlygig observe the wind direction so you do not get it stuck up on the roof of the house or high up in a tree. Although it can be done, most moms will probably NOT want the Whirlygig flown in the house. This is a fun toy that any kid from age 8 up to, yes, even adults can easily master. Instruction sheet on "How to Operate the Whirlygig" is included with every order. Click here to see what people say about our Whirlygigs! We have had a lot of people ask if we would make a limberjack kit over the years, so we finally got around to doing it. It is exactly like our standard limberjack except you get to put it together! This functioning limberjack kit can be built in under an hour. It is a great project for anyone who would like to have a limberjack and the fun of building it themselves. A great activity for schools, scouting and 4-H. Recommended for ages 7 to adult. Kit includes stick and dancing board to make your limberjack dance. Tools required: Flat blade screwdriver, hammer, wire cutters, sandpaper & wood glue. 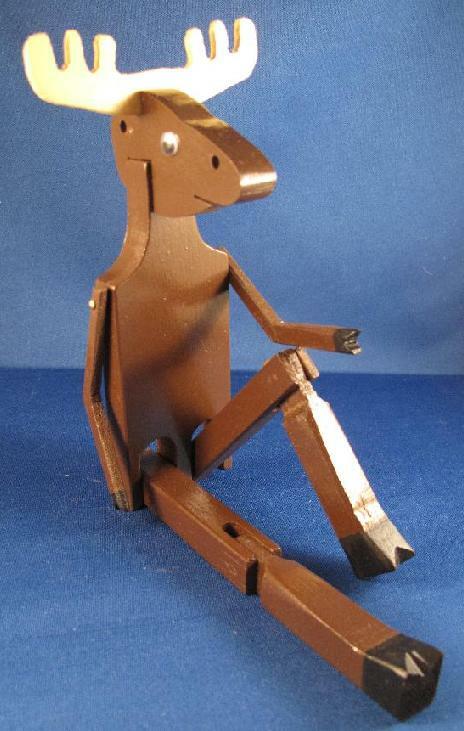 Includes detailed assembly instructions, how to dance the limberjack. What are you waiting for? Build your own Limberjack Dancing Doll today! He can move just like our standard limberjack with articulated joints at shoulders, hips and knees. He does not dance (as far as we know) but he is can be posed in many fun positions around the house. He is made of Indiana soft maple and birch dowel pegs. Like the originals, he is left unfinished. You may wish to paint or stain him, or as I prefer leave him unfinished. Whether as a gift for a limberjack maniac, a toy for the kid who needs something without batteries for a change, a decorative accent, or just for fun, Charlie's REALLY BIG limberjack will make you the envy of everyone on the block! Note: If ordering this item from outside the US, as it is somewhat heavy and BIG, please call or email for shipping to your address. Thank you! All original designs are Copyright 2012 Prairie Wind Toy Co.
Limberjack Hospital: If one of our limberjacks ever has a mishap and needs to be repaired, just send it in and we will promptly repair it for free and send it back to you. Please include cash or check for $5.00 for return postage. Be sure to include your return mailing address! International Orders: May require additional cost for shipping, especially on larger items. We can easily send you a Paypal invoice for the difference. Limberjack, whirlygig, or hooey stick questions? Click to email us questions about our handmade folk toys.